Known as Tar Spots, these black splotches on the leaves of Silver Maples are caused the fungus Rhytisma acerinum. The fungus doesn't affect the overall health of the tree. The black spots are the spore producing structures of the fungus, and are only seen in the fall. The rest of the growing season the fungus is living within the leaf tissue, unseen. It overwinters with its fallen leaf host until spring. Then the spores are released, with some of the spores being carried by the wind to new leaves to start a another generation. 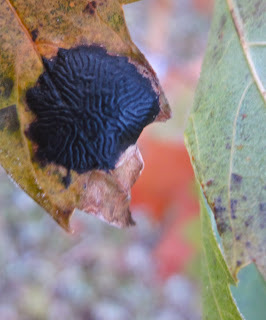 Tar Spot and galls of the Maple Bladdergall mite (Vasates quadripedes) together on the same leaf.